1. Preheat the oven to 180°C, gas mark 4. Start by making the crunch. Roughly crush the pecans in a pestle and mortar, then tip into a mixing bowl. Roughly crush the amaretti biscuits and add to the nuts. Stir in the fl our, sugar and a good pinch of salt. Use your fi ngertips to rub in the butter, until it resembles clumpy breadcrumbs. Sprinkle onto a baking tray and bake for 15-20 minutes, until golden; set aside to cool. 2. Meanwhile, make the amaretto cream. Put all the ingredients in a bowl and use a balloon whisk to lightly whip them to soft peaks. 3. Preheat the barbecue or griddle pan. 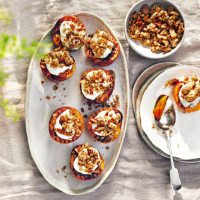 Toss the nectarines in a bowl with the butter and amaretto. Griddle for 2-3 minutes on each side, until nicely charred, then put on a platter. Top with the cream and a scattering of the amaretto crunch.